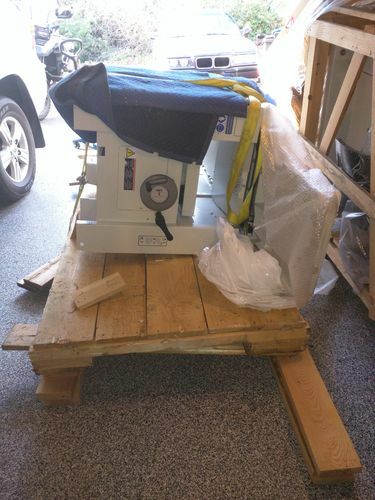 I recently received a Jointer/Planer and Bandsaw from SCM Group; Sam was the sales person. When I unpackaged the J/P I found it in a terrible state; laying on its side with a lot of damage. I actually can’t even move it as it weighs ~1500lbs. SCM told me to work it out with the shipping company and has not made an attempt to replace the unit. Sam, the sales person, told me they could be a “cheerleader” while I worked to file a claim with the shipping company and when I expressed that was not acceptable he threatened to hang up on me. Earlier when ordering Sam assured me they would take care of any shipping issues should they arise. I repeatedly asked SCM group that I wanted to hear they would make this right. I asked for a replacement unit and provided photos for their claim. They responded that I needed to work it out with the shipping company and have made no offer to make this right otherwise. I have since asked for my money back and for them to schedule pick up of the inoperable unit. Giuseppe Riva the CEO was copied on emails with no immediate response. Do you have proof that they would take care of any shipping claims? Why did you accept the shipment? Something that large would have had to come by LTL freight, so it’s not something that would have been left on your doorstep. Just playing devil’s advocate, sorry to hear about the situation. My thought is that no sales person is going to say, “sure, we’ll send you out a new $9000 unit – expect it tomorrow!” To me, the response that they are going to investigate with the shipping company and get back to you is acceptable for an immediate response. If the shipping company is at fault, they SHOULD be responsible for the costs. I would give the salesperson/CEO a chance to investigate the situation and respond back before gettting too worked up. If they come back to you with their answer and that’s not acceptable to you, then that’s a different story. I think SCM is a reputable company who won’t leave there customers hanging. I would start going up the ladder, possibly by asking company headquarters who you should talk to next. This is a real sad situation, please keep us informed. I feel for you. I’m always a little anxious about buying something big and heavy like a woodworking machine or air compressor that gets delivered to my house by freight truck. If there is some damage or problem everyone wants to pass the buck to someone else and it could be very expensive and/or difficult to return the item. It’s very frustrating as a consumer, but I understand why the sellers/distributors do this—any additional interaction with the customer after the sale (for that sale) is likely going to cost the company and/or distributor money (time=money). I don’t like it, but I understand their position. Excellent customer service does not always translate into repeat customers. When I’m in this type of situation I try to remind myself to be courteous and respectful to anyone that I interact with related to this transaction. The problems you are experiencing are likely not their direct fault and/or they are there to try and help you or provide you with information. Have you contacted the shipping company? If so, are they willing to do anything? What is their position on the damage and their culpability? Did you buy directly from SCM or through a distributor? Is there a warranty on the damaged J/P? You should document everything you have done so far and include photos in the documentation. If you decide to contact a lawyer or get the opportunity to make a plea to someone like the CEO—then having all the information documented in chronological order will help them understand what transpired. Good luck and I’ll be hoping for a positive outcome for you. Sorry to read about issues? IME – Damaged freight shipments via commercial carrier are painful. First – Do not shoot messenger: The company selling the product damaged in transport typically has no liability on paper; Regardless of what they say. They delivered the product to the shipping company they picked, which you agreed to use when you signed the purchase contract. So the damage dispute is between you and shipping carrier. if you signed for the damaged shipment and accepted delivery (fine print always says you inspected and found in satisfactory condition), then need to follow instructions from SCM: file a damage claim with transportation carrier! Process to correct hidden “accidental” shipping damage is sort of like being in an automobile accident? IE – No one wants to admit there is a problem, nor pay for the mistake, and there is lots of paperwork and delays figuring out what went wrong (while trying to avoid fraud). So only after the trucking companies insurance has reviewed the damage/loss, determined corrective measures, and approved payment; will the equipment supplier be paid to correct the problem. Highly suggest making a face to face visit to trucking companies local terminal for quickest turn around on a claim. Phone calls seem to fall on deaf ears, unless you are regular customer for carrier. The equipment needed to remain in the packaging to get it home. The CEO did reply to me after I asked for assistance and stated that they were “not sparing any effort resolving the issue”. I hope that means they are going to take care of the situation. That’s all I really want to hear but they have immediately put the burden on me to work it out with the shipping company. They are able to file a claim unlike me according to the shipping company. I immediately provided a report to the shipping company with pictures. I have stated and have supported their efforts for a claim. If you paid on you credit card, report it to them and stop payment. Once that happens people tend to move faster towards a resolution. Why on earth did you accept delivery of something that is damaged? If you get a freight delivery, you should inspect the thing six ways from Sunday to make sure it’s in good shape. If it isn’t, you refuse the deliver and they take it away. If it didn’t come off the truck on its side and damaged-looking, what happened in between when it did come off the truck and the picture? I wasn’t aware of the damage. The packaging concealed the damage. It was only after getting it home did I unpackage it to see it on its side. For whatever reason it was not delivered to my home and instead I had to pick it up from the distribution center at the freight company. When I discovered it was being sent to a location 2 hours away I petitioned the person sending it and was told “that’s something you should have worked out with your salesperson.” So I went with the flow. Why on earth did you accept delivery of something that is damaged? If you get a freight delivery, you should inspect the thing six ways from Sunday to make sure it s in good shape. If it isn t, you refuse the deliver and they take it away. If it didn t come off the truck on its side and damaged-looking, what happened in between when it did come off the truck and the picture? Exactly what I was going to suggest. If you paid via AmEx, or some other major CC, call SCM and tell them that either they make it right by yesterday or you will immediately tell the CC company to stop payment. That’ll light a fire under their butts, I guarantee you. CC is now in dispute with the hope of using it as leverage towards a fair resolution. Definitely an unfortunate event. But the fact that you signed for it and accepted it from the shipping company is going to making things more complicated than they should be. You should have opened it there to inspect it. Technically, I can see where you could be stuck with the damaged machine because who’s to say that it happened during the initial shipping? Not saying that’s the case, but SCM and the shipping company could potentially say you damaged it while hauling it two hours. You’re not allowed to unpack items at the dock. I noted the packaging and took photos at the time of pick up. There are also laws that deal with this specific issue where the lack of unpacking doesn’t make you automatically responsible for undiscovered damage. The specific activity of re-packaging the item during shipment according to SCM tells the story of what happened. If this were delivered to my home a lack of inspection would be a different story. I wasn t aware of the damage. The packaging concealed the damage. For whatever reason it was not delivered to my home and instead I had to pick it up from the distribution center at the freight company. When I discovered it was being sent to a location 2 hours away I petitioned the person sending it and was told “that s something you should have worked out with your salesperson.” So I went with the flow. truck on its side and damaged-looking, what happened in between when it did come off the truck and the picture? Theory: The shipper knew it wasn’t right, and avoided delivery to your door knowing you’d reject it there and they’d be stuck driving it back to the warehouse. Instead, they reduced cost by having you come for it. Then you (mistakenly) signed for it and took it off their hands anyway! First laughs are theirs, but yes, they have to make it right. What a PITA.